Yoga with Melissa is on Joy and Gratitude. 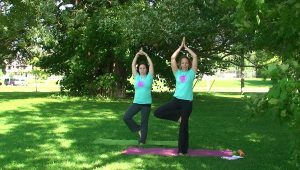 It is with joy and gratitude we present to you the 100th episode of Namaste Yoga. Today’s theme (thanks to Yoga with Melissa viewer Elissa Richmond) is all about joy and gratitude. Melissa begins this episode with tears of joy and gratitude for the first 100 episodes and all the viewers who have shared them with her – but stick with it because she does pull it together and share a joyful class. This class is made up of your requested postures so thank you to: Florianna Raudino for pran mudra and spinal energy series, Kelly Howard for Wild Thing Pose, Ivy Tulin for pigeon, our Italian viewers – Floriana Raudino, Linda Scardina & Viola Vazio for tree pose, Rondell Parker for breath of joy and lion’s breath, Roxane Lesa for Dancer, Elisa Richmond for legs up the wall and Karen Holden for alternate nostril breathing. Thank you to each and every one of you who have shared the last 100 episodes with us. We are eternally grateful to share this beautiful practice of yoga with you. Life is kind and in that we find joy.